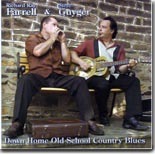 Great old school blues comes to us from Philadelphia by way of the duo of Richard Ray Farrell & Steve Guyger. Down Home Old School Country Blues is this month's Pick Hit. Broke & Hungry Records execs went Searching for Odell Harris, and wound up finding themselves one of the best CDs of the year by none other than --- Odell Harris! This great CD is our Surprise hit for the month. The late, great blues legend Robert Lockwood Jr. is honored in this month's Flashback section, as we take a look back at two of his excellent recordings from the 1970s and 1980s. This month's What's New features new releases from the Phantom Blues Band, Sean Carney, JJ Cale & Eric Clapton, Deanna Bogart, Doghouse Daddies, Piney Brown, and Ben Bowen King, plus a combo CD/DVD that takes a look at the 12-year history of Ruf Records.